The Slow Food movement was founded in the Langhe district of Piedmont, Italy, in 1986 and has spread throughout the world as an alternative to you-know-what. In Torino, Italy, it is manifest in Eataly, a food emporium and eatery on Via Nizza just across the street from a massive Fiat factory turned cultural center and hotel. From the outside, Eataly looks like a typical big box store, but inside it is a veritable small town of gastronomic wonder with individual cafes and lunch counters each serving specific kinds of food, including meat at one, fish at another, etc. There are also classes for slow food adherents. A New York version of Eataly, started by Mario Batali, Joe Bastianich and Lidia Matticchio Bastianich, opened in 2010 in the 36,500 foot lobby space of the old Toy Building on Fifth Avenue near the Flatiron Building, quickly becoming a magnet for epicures, gluttons and everyone in between. It is also as crowded and chaotic as Times Square, which dissappointingly subverts the intent of the original. Slow food? While the products and produce are fabulous, Eataly New York is little more than an upscale fast food court. Of course, its better to eat healthy than the daily fare served at any of the industrial food chains, but there is a kind of unharmonic dissonance when good, slow food is comodofied on such a grotesque scale. And despite its spacial humungusness, people are sardined in the space, moving, milling and spilling. Why would anyone want to eat – slowly – in that environ? Maybe it's just a New York thing. Eataly in Torino was not without its crowds (among them tourists, of which I was one), but one could always find a seat for a leisurely and delicious meal. 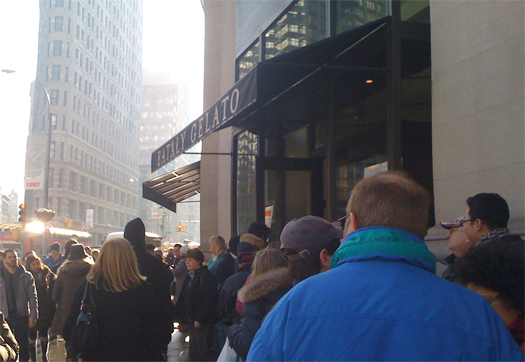 New York is so jam-packed that the other day, people waiting around the block for gelato were only allowed entry ten at a time. Gelato in winter? 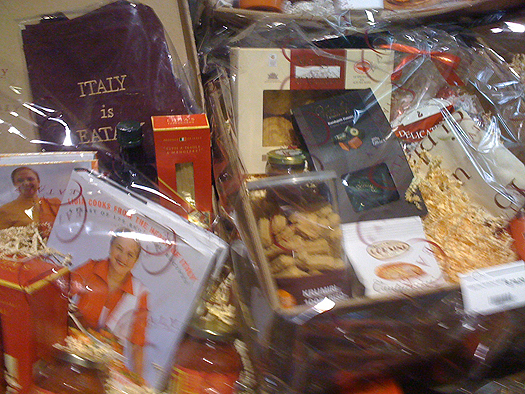 Eataly in Torino is brimming with artisanal food stuffs and local products, while in New York it is bursting at the seams. And it seems, Eataly New York suffers, not from a lack of quality (it would be perfect if not for the throngs), but from a misguided sense and aesthetic of grandeur as large as Mr. Batali and Ms. Bastianich. 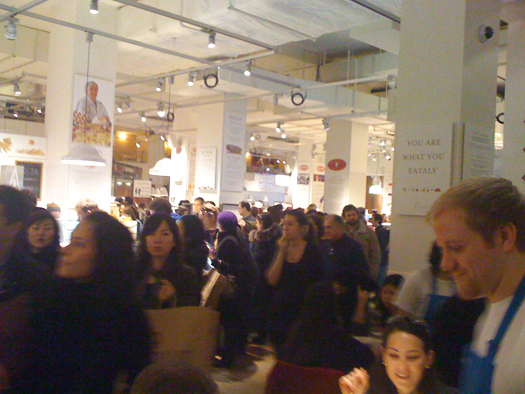 Perhaps in order for Eataly New York to be sustainable, it must sustain too many people all at once. New York has always been known for its crowded and trendy culinary establishments. Food has long been more than mere sustenance — it is art, culture and entertainment — and let’s not forget, status too. Food as accessory. Once, people shopped at convienice stores (or stores that were convienient), now consumers will go far out of their way, not just for bargains to places like Trader Joe’s or Fairway, but for status foods with exotic packages and exclusive sustainable pedigrees. Eataly in Torino offers much the same things, but in a modest, natural away. Italy may have fast food, but the speed limit is considerably more restrained. Eataly in New York knows few restraints. Rather than a soothing experience, stress appears on the menu. The minute one walks through the door, leisurely dining is rare. Contemplative time at the fish, meat or pasta counter is impossible. Speed is the essence of the Eataly experience — Eatfastaly — because the speedier the traffic flow, the more people can be allowed in ten at a time, and get to the bigger, fatter, faster feast. Interesting; I was just at Eataly last weekend. When I heard about it, I thought it was SUCH an American concept. With the ludicrous pun it sounded like some Epcot-esque simulacrum; the referring source and the association with a known chef made me believe that it was probably GOOD despite what the name evoked. In fact, searching for the details on my iPhone so I could navigate to this place produced hits from eataly.it and eataly.jp which surprised me - this is not an USA-only idea, and in fact, it's emanating from an authentic source? As far as an experience, I was struck by the lovely graphic design (enthusiastic, comforting, inspiring, informative posters about the food) but the absolutely abysmal functional. Maybe there's more than one entrance but where I came in, there was no grounding info: you'll find stands, groceries, and FOUR (or is it five?) RESTAURANTS with two or three seating stations that you have to find if you want to be seated? 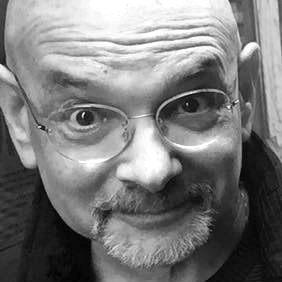 Of course that lack of basic functionality reminded me of my visit to Rome last year where I discovered how many things that you would never imagine not working wouldn't be working. Anyway, as an experience, you are forced to choose (as a group, if you are in group) what you want to eat, because once you are seated you can only order from that menu (pizza & pasta, fish, meat, etc.). And maybe by complaining about that I'm simply reinforcing the point above; but I'll say that the place itself foisted an overwhelming sense of bounty and choice but didn't help you succeed in that choice. And whether that's an Italian or American design failing, I am not worldly enough to say. I am tired of restaurants being a manipulated happening. Let's get over it! The enjoyment of dinning is to be able to enjoy the food, surrounding and company, all at the same time without the attention to glamour and style as a celebrity quota requirement for restaurants to be "in". Is it possible? I doubt it. We make too much of the experience of dinning, as if we in this country have never had restaurants in our lives. Give me a break. Such a confusing and overwhelming experience. If there is a floorplan, I couldn't find it. It's like a food maze that leaves you exhausted and OTT stimulated. Making a choice is next to impossible. Thanks for the clarifying info. Beth and I had similar thoughts when we stopped in recently. Now I only use it for the coffee counter on a crosstown SVA jaunt or to buy pasta in obscure shapes (one of Batali's favorite tricks to play in his cookbooks). I was lucky to have visited the Eataly in Torino and you're right, completely different experience. New York's version feels contrived and yes, stressful. I was very disappointed. In Torino, we were able to sit and enjoy, slowly wander through the aisles. The store was full, but didn't feel like New York crowded. And, I'm not one to wait online for food. I think we waited under five minutes to order our gelato? It's like visiting the New York hotel in Los Vegas. Something's just not right. I have to say that I was rather taken by my experience with Eataly in New York. I should go ahead and clarify that when I visited, I was visiting as a tourist. That being said, my friend (a native New Yorker) and I stopped into Eataly around 7:30pm, opted to eat at the veg restaurant and enjoyed absolutely stunning spaghetti squash bruchetta and a lovely glass of wine. We didn't have to wait to sit down, and actually enjoyed sitting, eating, and conversing amidst the bustle of the market. It was the perfect place (for us) to eat excellent food at a reasonable price, and we didn't feel the least bit rushed. Maybe give the place a second try? It's New York. It's crowded and fast. Sometimes I stop by to pick up fresh ingredients to cook at home. Other times, I make my way to the back to have a slow meal with a friend. Either way, elbow your way in and you won't be disappointed. Has anyone *been* to Italy (for anything besides an expensive tourist vacation)? Nothing about a massive, overpriced grocery store is authentic to an Italian approach to eating. It's horrifying to see that place being passed off as anything but a contrivance. You'd be better of going to the Village and buying pasta at the pasta shop, meat at the butcher, etc. Better food, better experience, better place for your money to go.